Imitating the formula of the popular Infernal Affairs franchise within the Wuxia genre, the Brotherhood of Blades sequel is actually a prequel for the three central characters from the 2014 hit. Although this removes any uncertainty over the fate of these characters, there is enough depth within the development of the plot to compensate for the lack of suspense. 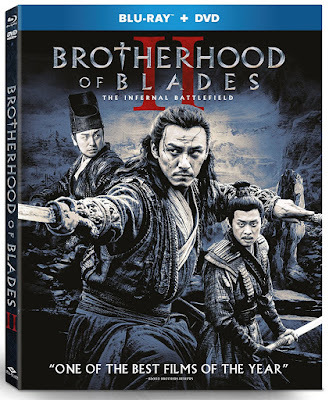 This paired with a complex plot that often takes full concentration to follow completely, makes Brotherhood of Blades II a rich film experience that is able to stand on its own, while also working as a companion piece for the pre-existing fans. Continuing the theme of brotherhood amongst betrayal, Brotherhood of Blades adds in elements of an ill-fated romance, which often takes primary focus in the narrative. Although others from the first film are present, the main protagonist is Shen Lian (Chen Chang), who is a loyal imperial guard for the Ming dynasty until he becomes entangled in a conspiracy to frame him and his partners. In an effort to clear their names, Shen hunts down a wanted woman named Bei Zhai (Mi Yang) in hopes that she can provide the answers needed to solve the mystery. In finding her, Shen discovers that it is far more complicated than he could have imagined, and must decide where his loyalties lay. I will refrain from giving away too many more details in the complex storyline of betrayals and hidden agendas, for two reasons. First, this film is a journey that is all about the characters and their development through trust that is either kept or broken. To give away the steps along the journey seems to sacrifice some of the viewing experience. The second reason is that the complexity of the film was often too much for me to follow while I was watching it, and I’m not entirely sure I could recount all of it right now, even if I wanted to. Although it makes for a film experience that demands your full attention, Brotherhood of Blades II also provides more density in its narrative than the average martial arts film. Story may not be the main reason a majority of martial arts fans watch films such as these, however, and Brotherhood of Blades II provides plenty of scenes of action to indulge upon. Tied to realism more than many Wuxia films, there is no flying or other moves that defy the laws of gravity. Instead, there is a careful choreography that shows off the precision of these fighting traditions, and the obvious work ethics of the performers in capturing this. Every detail from the weapons being used to the posture of the fighters feels as historically loyal as the costume and set designs. It doesn’t feel like a movie that needs to throw in modern moves or new ideas in the fight choreography just to make it more exciting, but that refusal to resort to flashy tricks is what ends up making Brotherhood of Blades II such a strong film. The Blu-ray release of Brotherhood of Blades II also comes with a DVD copy, and both discs have a couple of basic bonus features. There is a trailer and the option for English dubbing if anyone is too lazy to just read the subtitles, but the only real special feature is a behind-the-scenes featurette. As successful as these films have been in China, their impact in the United States has been less noticeable, and the lack of more extras is a solid indicator of that.